It's almost de rigueur now. Once a rich collector accumulates a critical mass of art, the next step in attaining social esteem is building an eye-catching museum to show off the array. There are hundreds of them in art centers around the globe—some public, some private, most focusing on contemporary art. Then there is the 10-year-old Minnesota Marine Art Museum. Located in Winona (population 27,500), it was founded and is principally supported by collectors Robert A. Kierlin and Mary Burrichter, but it's nothing like the others in spirit, collection or ambition. Its name is a bit of a misnomer, too. Along with the classic sailing-ship paintings of Fitz Henry Lane and James E. Buttersworth, visitors will find landscape, portrait, history and still-life paintings by such 19th- and 20th-century artists as Claude Monet, Thomas Cole, John Constable, Georgia O'Keeffe, Stuart Davis and even Vincent van Gogh. Mr. Kierlin, the founder of Fastenal, a large distributor of nuts, bolts and other construction supplies, and Ms. Burrichter, Winona's finance director, began collecting about 15 years ago, after they married and moved into a new house. Confronting a large blank wall in their living room, they mentioned their quandary to a neighbor, who soon handed them a stack of old art magazines. In a three-year-old ad, Mr. Kierlin found a marine painting he liked. He called the dealer and the painting was theirs, sight unseen. They bought other works like that, not looking in person and not even knowing that art prices can be negotiated. But they sought advice, learned and decided to create a museum, with some help from other locals, that would make Winona a more attractive place to live (and work). They chose a shingled design resembling a turn-of-the-20th-century riverside warehouse, placed much of their cache on permanent loan, and redefined "marine" as any work with enough water to "float a boat." That patch of blue is sometimes quite small, as in Mary Cassatt's "Francoise in a Round-Backed Chair, Reading" (c. 1909), where water is visible only in the distance through a window, and Gauguin's "Still Life With Onions" (1889), where it appears only in a Japanese woodcut in the background. Twice now the couple has made purchases that caught some notice. In 2014, they bought the small (about 5-foot-long) version of Emanuel Leutze's "Washington Crossing the Delaware" (1851), which had been on loan from a private collector to the White House; his 21-feet-long version, painted the same year, hangs in the Metropolitan Museum of Art. 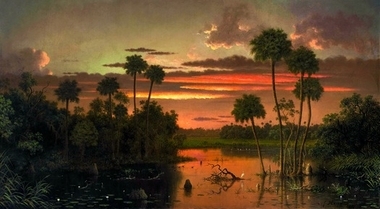 Then, last fall, they bought Martin Johnson Heade's monumental "The Great Florida Sunset" (1887) from the estate of A. Alfred Taubman. The dramatic painting—"a heroic transcendental celebration of nature," as Heade scholar Theodore E. Stebbins Jr. deemed it—is here reunited with the artist's "View From Fern-Tree Walk, Jamaica" (1887), which the couple bought in 2014. Both were commissioned by Henry Flagler, a founding partner of Standard Oil Co.; they hung in his grand, Spanish Renaissance-style St. Augustine, Fla., hotel, then later in his Palm Beach residence, which is today the Flagler Museum. Ms. Burrichter and Mr. Kierlin remain active buyers, seeking, she said, only the best works—among "the top five"—by any artist or works that mark a turning point in an artist's career. At a glance, for example, you would not recognize "The Beach at Scheveningen" (1882) as a Van Gogh. But this plein-air study, documented as his first independently made work, illustrates his experimentation with brush strokes and palette knife. Piet Mondrian's loose, brushy but representational "Two Trees Silhouetted Behind a Water Course" (1900-02) foreshadows the geometry of the abstract paintings that made him famous. Many works here are marvels, even if they don't meet the "top five" qualification (which would be near-impossible—those works are already in museums). Consider Edgar Degas's beguiling "The Trainers" (c. 1892), an atmospheric pastel of five jockeys on horseback in tall green grass that is slashed horizontally with an ethereal blue stream of water. Or take Marsden Hartley's striking "Autumn Cascade" (1908), a small impastoed painting of nature in the abstract, exploding in jewel colors. One of the three permanent collection galleries—all spacious, dramatically lighted and painted blue—is devoted to the Hudson River School, with Cole's "A View of Boston" (1837-39) being one standout. Its presentation of a shining city on a hill, viewed from Roxbury and framed by a pastoral landscape, attests to Cole's observational powers and talent for detail. It's nicely flanked with works by two artists he influenced, Asher B. Durand and John Kensett. 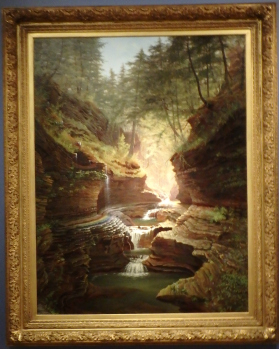 There is also room for painting like "Rainbow Falls, Watkins Glen, New York" (1871), a sunlit, craggy landscape by self-taught artist James Hope. The museum mixes in other less familiar artists, too. One notable example is Daniel Ridgway Knight, a painter of sweet, idyllic scenes often populated with peasant girls. Here, "The Brook" (1894), which depicts two kerchiefed girls, baskets in hand, crossing a stream on stepping stones, shows off his skill with light, especially in the reflections in the shimmering water. The Minnesota Marine Art Museum is a tranquil place, given to art that calms rather than stirs; there's room for that idiosyncratic approach in the nation's museum landscape.